Hyperthyroidism is an important illness for carers to be aware of since it affects about 10% of cats over the age of 10 years. The most common clinical sign of this illness is weight loss, often in spite of a normal or even increased appetite. 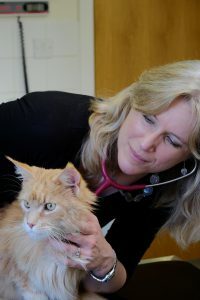 Clues of hyperthyroidism are often present on veterinary examination and include a palpable goitre (enlarged thyroid/s that can be felt), fast heart rate and heart murmur. Blood tests are needed to confirm the diagnosis. Fortunately there are several very effective treatment options for this condition including medication, an iodine-restricted food, surgical removal of the abnormal thyroid tissue and radioiodine. Most cats diagnosed with hyperthyroidism can be managed very successfully and in some cases it is possible to cure the condition permanently. What are the thyroid glands and what is hyperthyroidism? All cats have two thyroid glands, one on each side of their neck, usually just below the voice box. The thyroid glands produce two hormones tri-iodothyronine (T3) and thyroxine (T4). Each thyroid hormone contains a protein and some iodine (in the form of iodide): T3 has three iodide molecules whereas T4 has four. Thyroid hormones act on all of the cells of the body and are especially important in controlling the cat’s metabolism. Cats suffer from hyperthyroidism if their thyroid gland is producing too much thyroid hormones. Hyperthyroidism is usually caused by benign overgrowth of the thyroid gland/s (adenoma or adenomatous hyperplasia, approx. 98% cases) but very occasionally can result from a thyroid cancer (adenocarcinoma, < 2% cases). What are the clinical signs of hyperthyroidism, what might a carer notice? One of the most common signs of hyperthyroidism in cats is weight and muscle loss, despite the cat generally having a normal or even increased appetite. 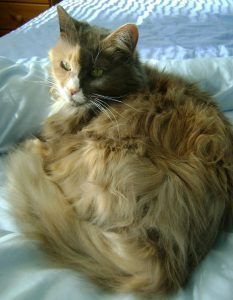 If left untreated, hyperthyroidism can lead to a dramatic weight loss – such as that shown in the photograph of Rizla above. Behavioural changes are common with hyperthyroid cats often being more irritable, restless and less happy. Increased vocalisation, especially at night, is also common. Owners often notice that the cats shun warm areas, and if they use a litter box, that this needs emptying more frequently due to an increase in the volume of urine produced. Increased appetite, vomiting and diarrhoea are often present in cats with hyperthyroidism. Coat changes can also be seen and generally their coat becomes dull and in poor condition. Table 1 summarises the common clinical signs and their approximate frequency. Hyperthyroidism is a common condition of the older cat. It is rare in cats under the age of 7 years but estimated to affect one in ten cats aged 10 years and over. Clinical findings in cats with hyperthyroidism. Listed in approximate order of decreasing frequency. These signs are a consequence of the impact that the thyroid hormones have on the body (Table 2); they generally have a gradual onset and therefore the owner may not notice anything amiss initially. 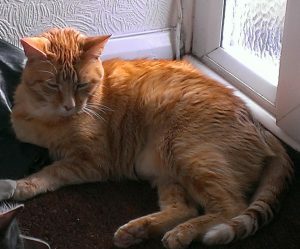 This is one reason why routine health checks are so important in cats – a simple weight check may reveal weight loss that is not obvious to the carer who sees their cat every day. I recommend that up to the age of 10 years, an annual health check (including a weight assessment) is performed by a veterinary professional, with six monthly checks in cats aged 11-14 years and three monthly checks in cats aged 15 years and over. Health checks are a great opportunity to identify problems at the earliest possible time point with early diagnosis typically leading to a better outcome. Clues of hyperthyroidism that a vet might detect are summarised in Table 3, most common is being able to feel an enlarged thyroid gland (a goitre), which can often be felt in hyperthyroid cats. How is a diagnosis of hyperthyroidism confirmed? Blood tests are needed to confirm whether or not a cat has hyperthyroidism. Usually, a single test measuring levels of thyroid hormone (T4) quickly confirms the diagnosis – levels of T4 are increased in cats with hyperthyroidism. Where possible it is an advantage to perform a general blood profile (haematology and biochemistry) and urinalysis. Hyperthyroidism is common in older cats but these cats commonly also have additional medical conditions such as chronic kidney disease and diabetes mellitus. Any concurrent illness can impact on how the hyperthyroidism will be treated. Checking the cat’s blood pressure is also recommended where possible since about 20% of cats with hyperthyroidism are found to have high blood pressure. 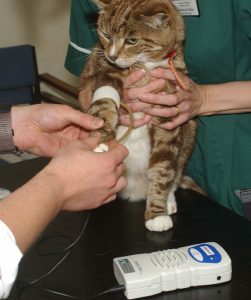 Most clinics have facilities to assess your cat’s blood pressure (see below). High blood pressure (systemic hypertension) can be treated with medication. If the blood pressure is found to be high, this is usually straightforward to manage using anti-hypertensive medications designed for cats. What are the management options for hyperthyroidism? There are two broad categories of treatment: potentially curative, permanent options such as radioiodine and surgical thyroidectomy and reversible options such as an iodine-restricted food or medication. If using a reversible option, this is needed for the rest of the cat’s life or until a potentially curative treatment can be performed. I) An iodine-restricted food is available for the management of hyperthyroidism. Hill’s y/d™ contains very low levels of iodine meaning that the thyroid cannot over-produce thyroid hormone. Thus, this is a reversible and symptomatic treatment option. Whilst the food is widely available and potentially offers a simple solution to management (assuming the cat will eat the food!) there are some challenges to using this option. Firstly, the cat with hyperthyroidism must not eat any other food as this risks increasing their iodine intake. Secondly the iodine restricted food is not recommended for healthy cats so is not an ideal solution in the multi-cat household. Lucy is an example of a cat for whom the iodine-restricted food was ideal and she did extremely well on this management. Lucy’s carer was disabled, meaning that giving medication was not possible. Luckily Lucy loved the iodine-restricted food and did extremely well on this, gaining weight and maintaining a lovely coat. II) Anti-thyroid medication (liquids and tablets available) is a very popular treatment option since it can be used short or long term in cats with hyperthyroidism. The medication works by blocking production of the thyroid hormones so it is needed for the rest of the cat’s life, or until a permanent treatment option can be performed. 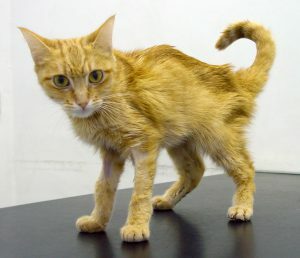 Most cats tolerate this treatment very well although a small number of patients may suffer from side-effects which can sometimes be very serious. 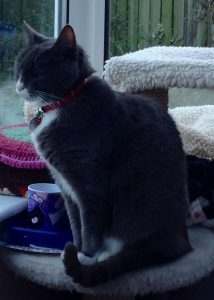 Foggy is an example of a cat treated very successfully with anti-thyroid medication. Weight loss was the main clue to Foggy’s illness, but his coat condition had also deteriorated. 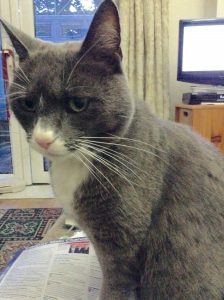 In the post-treatment photograph Foggy had been receiving anti-thyroid medication for 6 months, and you can see that he had gained some weight, and looked much healthier and contented. I) Radioiodine is often considered the ‘gold standard’ treatment since it has very high cure rates with very few side-effects. The treatment involves giving a single subcutaneous injection of radioiodine which then becomes concentrated in the thyroid tissue resulting in local radiotherapy. Whilst the abnormal thyroid tissue is destroyed by the radiotherapy, the radioiodine does not damage normal thyroid tissue. Most cats will be cured within a few weeks of receiving the treatment. Unfortunately radioiodine is only available in a few specialist centres in most countries (and not at all in Japan) so limited availability may mean that this option is not available to all cat owners. Anna is an example of a patient treated with radioiodine – she did extremely well with this treatment living to be a very elderly cat indeed! Anna pre-treatment – Looking very thin and anxious despite her ravenous appetite. Anna post-treatment – Three months after radioiodine treatment. II) Surgical thyroidectomy is the name for the procedure by which the abnormal thyroid tissue is removed from the body surgically. This can be curative although in some cases the abnormal thyroid tissue will re-grow resulting in recurrence of hyperthyroidism. Occasionally thyroid tissue in the cat’s chest cavity (ectopic tissue) will continue to produce the hormones, which can mean that the cat is still hyperthyroid even after the removal of the thyroid glands. Surgical treatment is more readily available than radioiodine – most clinics will perform this surgery – but it does require an anaesthetic which may not be appropriate for a very fragile, elderly cat suffering from hyperthyroidism +/- other conditions. 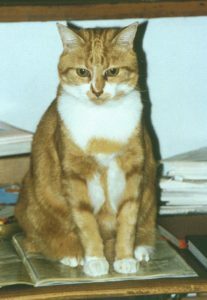 Ginger is an example of cat treated surgically. He was stabilised with medication before going on to have a thyroidectomy. His owner had spotted that he was losing weight, drinking more, and that his coat was in a poor condition (see below). 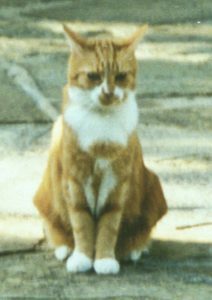 The second photograph of Ginger was taken a year later after he had received treatment with anti-thyroid medication and then surgery. 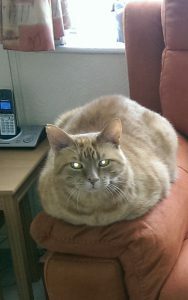 As you can see, Ginger had gained weight (possibly a little too much! ), is looking very contented, and now has a glossy and shiny coat. The ‘best’ treatment depends upon each individual cat and owner situation. All treatments have benefits and disadvantages, which is why it is important that carers discuss the management of their cat’s hyperthyroidism in detail with the veterinary clinic. 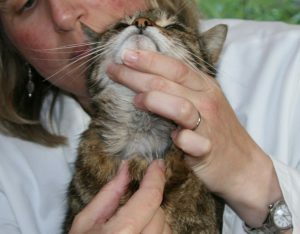 For the long term care of hyperthyroid cats, check-ups by a veterinary professional are really important and for those cats receiving reversible options, regular blood tests are necessary to ensure that the hyperthyroidism is under control and the cat is not suffering from any side effects. Most cats do very well when being treated for hyperthyroidism and the sooner it is diagnosed, the better the outcome generally. "Cats are connoisseurs of comfort"